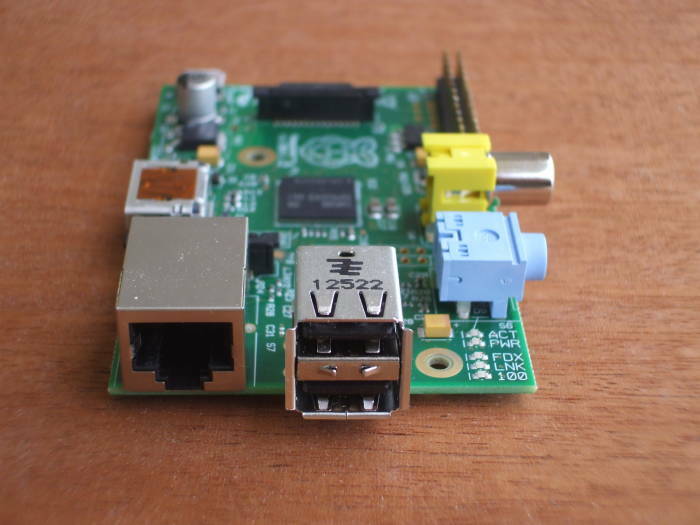 The Raspberry Pi is a small single-board computer capable of running a variety of operating systems. See the hardware and background page for details on its physical characteristics. Here you see an earlier Raspberry Pi with an SDCard and a Buffalo WLAN interface installed in the first picture. The module at the center at one end of the board is a dual USB port, an Ethernet port is at an adjacent corner of the board. The on-board Ethernet is actually a built-in USB Ethernet interface combined with the USB controller. The Ethernet controller appears as device number 3 on USB. Both USB and Ethernet support are provided by a LAN9512 chip detected and run by the smsc95xx kernel module. It supports 10 and 100 Mbps, both half and full duplex, and auto-negotiates the combination of speed and mode with the switch. Bus 001 Device 004: ID 413c:2107 Dell Computer Corp.
You could then add a few lines to the end of /etc/rc.local to correctly set the Ethernet parameters and then restart the network service. Or, more adventuresomely, create your own /etc/init.d/ethtool boot script and start it just before network in run levels 2 and 3 (full multi-user with text and graphics console, respectively). However, you would only need to do all this in an unusual situation where your switch cannot reliably auto-negotiate speeds and duplex modes. Make sure that your devices are detected. In the above command output, unlike what you see in the picture further up the page, I have plugged an Asus USB-N10 WLAN device into one of the USB ports. I have highlighted the network devices above. This situation provides two network devices: eth0 wired Ethernet and wlan0 802.11 WLAN. 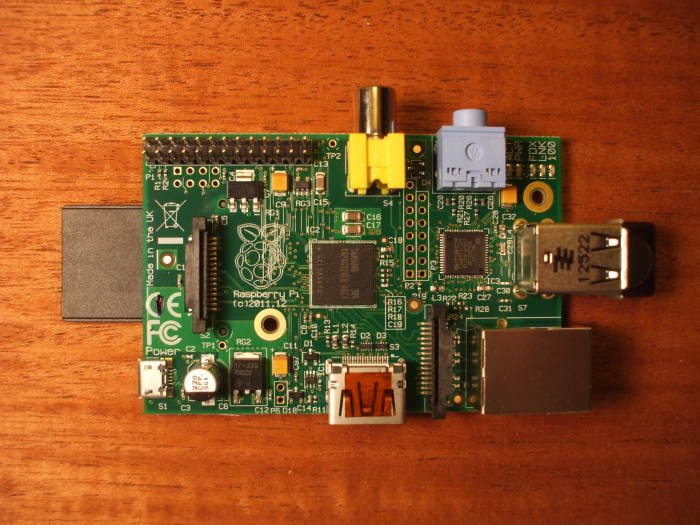 Raspbian is a derivative of Debian. This means that all the networking suggestions on this page should work the same way on any variation of Ubuntu Linux. In the interfaces file, a line starting with "#" is a comment. "End-of-line comments" are not supported, comments must be dedicated lines of their own. Here is an annotated example for IPv4 only. A later section shows you how to set up 802.11i/WPA2 so the wlan0 interface can securely associate with the wireless network. # Comments *can* be indented! # But there can be no content earlier in the line. # it does make the file easier to read. # Only the address/netmask is needed for the virtual interface(s). # The default route follows from the primary (physical) interface. Finally, you can have multiple IPv4 and multiple IPv6 addresses all at the same time. You just have to wait until after all the eth0 IP addresses have been assigned to set the default route for that interface. Let's check the results. As an ordinary user, /sbin isn't in our path. The first three IPv6 addresses were statically assigned and are globally routable. The fourth is automatically configured based on the last three octets of the MAC address, and is link-local, not forwarded by an IPv6 router. # This is the server for this subnet. # Make one client appear at a fixed address. Let's set up WPA2-PSK security! I found this a little confusing, as the iwconfig command uses the parameter essid while the wpa_supplicant.conf file must leave off the "E" for ssid. Notice that WPA-PSK means WPA generically, you then specify the WPA2 parameter to limit the interface to using WPA2 only. Otherwise, the interface will prefer WPA2 but silently roll back to WPA if that is all that the access point supports. Of course, that's quite likely what you want. Watch both the console output and the syslog messages carefully to spot your confusion over the precise form of these parameters! Syslog caught some errors for me that I wasn't seeing on the command line. See man wpa_supplicant.conf for details on other key management schemes, including WPA-EAP and IEEE 802.1x. bound to 192.168.0.101 -- renewal in 781090135 seconds. At the same time, the following is sent to Syslog. Notice that it starts dhclient but then 9 seconds pass in this case before wpa_supplicant negotiates the WPA2-PSK association with the access point. Then another 10 seconds pass until dhclient tries again and this time immediately gets an IP assignment. That's the result of the varying intervals between the DHCP transmissions. Apr 19 13:44:53 raspberrypi dhclient: Copyright 2004-2011 Internet Systems Consortium. Apr 19 13:44:53 raspberrypi dhclient: All rights reserved. Apr 19 13:45:02 raspberrypi ifplugd(wlan0): Link beat detected. Apr 19 13:45:02 raspberrypi ifplugd(wlan0): Executing '/etc/ifplugd/ifplugd.action wlan0 up'. Apr 19 13:45:02 raspberrypi ifplugd(wlan0): Program executed successfully. Apr 19 13:45:12 raspberrypi dhclient: bound to 192.168.0.101 -- renewal in 781090135 seconds. Apr 19 13:45:13 raspberrypi sshd: Received signal 15; terminating. Apr 19 13:45:13 raspberrypi sshd: Server listening on 0.0.0.0 port 22.
wlan0     IEEE 802.11bg  ESSID:"FBI_van4"  Nickname:"rtl_wifi"